That six-pack hiding under your belly fat doesn't have to stay there! Learn how to make those ripped abdominal dreams a reality. The abdominals are the centerpiece that completes the work of art—your body. They're a conversation starter, a double-take maker, and the center of attention. There's no doubt that a great-looking six-pack can turn your pretty-good physique into an excellent one. For a lot of people, seeing a model or athlete with chiseled abs is the beginning of an "I can look like that" mentality. Whitney Reid is one of those motivational ripped guys. He can also help you reach your most shredded abdominal dreams. Having graced several covers of magazines and been featured as a model around the world, Whitney is a fitness model extraordinaire. But don't be fooled. Whitney is also a weight-training heavyweight. 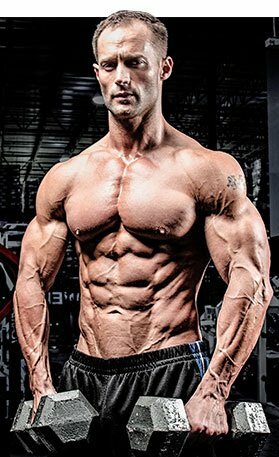 Check out his ab-solutely awesome plan and learn how you can master your midsection! Despite the huge amount of evidence to the contrary, many people still think they can train their way to great abs without considering their nutrition. "Even if your sodium levels are high, you can reveal your abs by drinking lots of water." What you eat and drink is more important than how you train. Visible abs are a product of low body fat, not endless crunches. According to Whitney, whole foods and plenty of water will get the job done every time. "I know it's overstated, but drink plenty of water and avoid all processed garbage. The more water you drink, the more you'll flush out. Without eliminating the subcutaneous water (i.e., bloat) over your midsection, your abs will never look completely detailed. Even if your sodium levels are high, you can reveal your abs by drinking lots of water. I recommend up to two gallons per day." Your midsection plays a major role in how you look and perform. A strong core will help you reach big numbers in the major lifts, which will help you get jacked overall. Instead of crunching your way to oblivion, Reid explains that focusing on big exercises is the best way to strengthen and grow your abs. "I feel that doing heavy squats and deadlifts every week is the reason for my midsection development," he confesses. Strong abdominal muscles are often bigger than endurance-trained abs, and therefore more visible when your body fat gets low. Whitney also believes in complete abdominal development, which requires a wide selection of exercises. "I learned years ago to focus on working my abs from the bottom up," he says. "To have a complete physique, the lower abs must be as detailed as the top ones." Although he focuses on the heavy squats and deadlifts as the "core" of his ab work, Whitney does throw in a specific abs workout occasionally. "I don't have a daily ab routine; I typically only do an 'ab workout' once per week. Usually, I'll do a quick circuit." There should be three components to your fitness plan: proper nutrition, serious training, and a solid supplement protocol. Whitney adds supplements to his stack when he needs to go the extra mile. "For my last photo shoot for Bodybuilding.com, I had to get really lean," Whitney says. "I used supplementation to help me reach my goals."